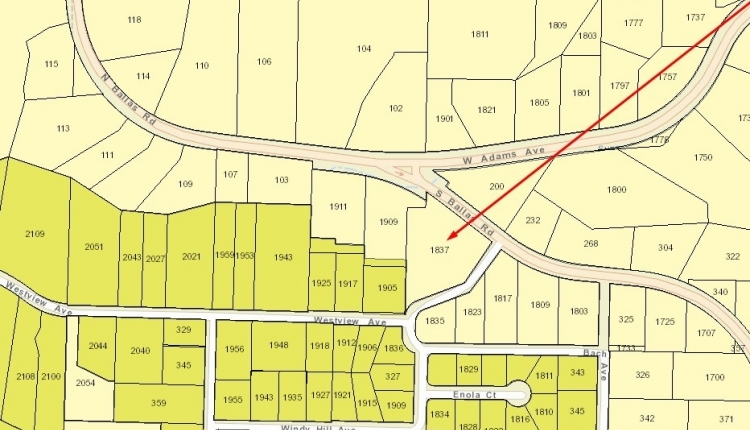 In her capacity as Trustee of the trust which owns the property at 1837 Bach Avenue, Ms. Sherry Swartzbaugh has submitted a petition to rezone the property from an R1 to an R1/R2 split zone, thereby allowing the property to be divided in to multiple lots with the potential to build up to 5 homes. An R2 designation would further allow for possible subdivision approval as a next step, which could permit even more homes being built on the property. •	Sugar Creek (Water Body ID 4117) is proposed to be listed as an impaired waterway by Missouri Department of Natural Resources. We feel a rezoning to R2 would allow for development that would permanently and adversely affect Sugar Creek’s integrity. •	There are currently only R1 properties along West Adams Road and Ballas Road in the Sugar Creek Valley. Rezoning this property will set a precedent and could allow for further destruction of all properties in Sugar Creek Valley. •	The lot is on a significant slope impacting drainage, sewer, roads, sidewalks, etc. The removal of the vegetation will most certainly create additional water concerns for the area. •	Removing the vegetation to build a number of new homes would not only destroy the beauty and privacy of the area but also the natural habitat of deer, foxes, groundhogs, etc. Their homes have already been destroyed by a number of other new developments in the subdivision leaving them little remaining areas to occupy. •	Due to the steep incline of the property, there is a limited sight line coming up and down the hill creating a significant safety concern for cars and pedestrians as the potential of a new street or driveways are added to the property. •	Many neighbors in this area bought their homes for the privacy that the Sugar Creek Valley area offers. Removing the protection of the trees and natural landscape of the property will lessen the value of the surrounding properties. We, the undersigned, respectfully call on the Kirkwood MO Planning and Zoning Commission to deny the request to rezone 1837 Bach Avenue from R1 to R1/R2 split zone. Update 3/27/18: To include the City of Kirkwood - City Council and inclusive of any re-zoning of this property. Update 5/14/18: Confusion over two Sugar Creeks in MO led us to incorrectly label Kirkwood's SC as an impaired waterway. Update 6/18/18: Per new information, we have verified that Kirkwood's Sugar Creek is proposed to be listed as "impaired." Update 6/18/18: Clarified the rezoning request to state "R1/R2 split zone," as well as updated the number of houses the petitioner is requesting. According to the petitioner's attorney (who quotes from Kirkwood’s comprehensive plan), “this area” is slated for one to two units per acre and they believe 3 houses in the R2 portion and 1-2 houses in the R1 portion would be appropriate for the property. This would allow a total of 5 houses to be built. Please visit www.savesugarcreek.com for updates and actions you can take to assist in the efforts of Sugar Creek Valley Conservation. We would appreciate any donations to cover the fees we pay to the City of Kirkwood for official documents and reports regarding the 1837 Bach rezoning matter, as well as the future costs of advertising materials and yard signs. If you would like to donate, please click here. We keep a detailed record of the amounts we receive and spend, which you can request at any time at eperrin75@yahoo.com. Thank you for your support! The Save Sugar Creek Valley! petition to City of Kirkwood Planning and Zoning Commission and City Council was written by Angie Stevens and is in the category City & Town Planning at GoPetition.